Tim Heaney also learnt to sail as a child and in his youth raced many small off the beach dinghies. He was a crew member in the Australian Flying Fifteen team for the World Titles in UK in 1988 and currently sails an off the beach Sabre class dingy and assists with junior sail training at the Gippsland Lakes Yacht Club. Tim completed an apprenticeship in carpentry/joinery and then worked in the building industry for many years before approaching James about employment within the boatbuilding industry. His enthusiasm and skills were welcomed and he soon became a loyal and trusted employee. 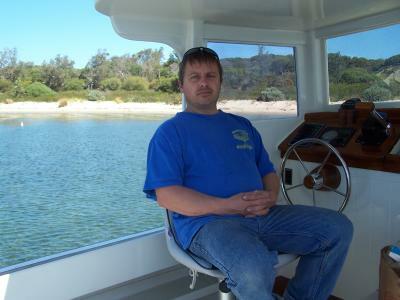 Tim undertook an adult apprenticeship while employed with the business and has qualified as a shipwright/boatbuilder. He has been employed with the business for 6 years and as leading hand has taken responsibility for management and operations.